dolly3900 This post is not being displayed . Hiya guys and guyettes, I've been offline for a while, change of job and far too many work commitments meaning too much time in work, nowhere near enough on bike and no time for BCF'ing. Anyhoo, on to my reason for posting. My lads (mentioned in previous posts), have all moved on from the trusty 125 now and progressed to various bigger bikes and cages, leaving the poor little CBF125 surplus to requirements. I have done a bit of cosmetic refurbishment to it and, once looking pretty, it was used for a few months just to get around whilst #1 son had his 650 nicked (long story). Since then, it has been sat in the shed, lonely and scared, but now I have someone interested in giving it a new home and the love it deserves. Problem is that when I hit the starter button after checking the usual battery, oil, fuel, etc. the little bugger will just not start. After testing all sorts of things, did a compression test ant it is reading bugger all, you can put your finger over the plug hole and can hold it there. Now then, suggestions I've had are rings (would they have fallen out whilst at rest), Valves (left in the fully open position when standing and oil clogged them up to stay open). Short of stripping the engine down, which I don't have the time for, any ideas from the massive brain and experience that is the BFC collective. Maybe check the clutch operation? What does the clutch have to do with compression? It could be stuck rings - try pouring a small amount of diesel into the cylinder and letting it stand for a day or two. That might free things up. The last single cyl engine with the same issue i had was the exhaust valve stuck open. I've tried redex down the plug hole, but no joy, will try a bit of diesel later and see if that works. I'll take a look at the YouTube video in a bit and see how I go. Long time away and still the help and response does not disappoint. L33n This post is not being displayed . As the bore is not a perfectly parallel cast and honed to an approximate, if the piston stopped when hot at a high point, the oil/carbon build up could make the rings stick in their groves, not against the walls, so when cool and gummed up, they'd not expand enough to take up the slacking the bore, hence no compression due to sticky rings. Please tell me how the rings can be stuck?? Seriously? Do you even know the difference between valves, rings and pistons? Rings can seize in their grooves, and valves can stick open, without seizing the whole engine. Wow. The voice of inexperience/ignorance. The rings can and do get stuck in the grooves - old oil and carbon can cause this. Yes the piston will move but the rings will be stuck and compression would be lost. It's a common problem. OP has tried oil down the plug hole with no joy, so it now looks more and more likely that he has a stuck open valve. The video posted earlier shows an interesting approach to freeing off a stuck valve without having the head off. I remember a loooong time ago riding out with mates on a borrowed 350 BSA single which had an exhaust valve lifter. I think it was a B33. Every bloody time the thing stopped the exhaust valve stuck open and I had the head off at least twice on the ride out which was only about forty miles. Fortunately the head was only held down by four pull down stud things. I don't know what they are called but these things were half way down the barrel on the outside and there were captive studs on the head pointing downwards which engaged with these deep nut / stud things. It took about ten minutes to have the head off, tap the offending valve with a screwdriver handle and 'ping' it shut. Back on and off we went again phutphut phutting down the old A69. This is about half a century ago or very nearly. You can see the fasteners down near the bottom of the cylinder here. The one I was riding wasn't in this condition. Yes rings can and do stick, yes valves can and do stick, open usually, so can clutch plates and caliper pistons, a yes valves can even "TANGLE" !!!!!!!!!! Valves on bikes ( apart from side valves ) , but not all bikes, are usually "inclined" meaning that a stuck open one will be really damaged by a rising piston. Valve, guide, head and piston in real danger, SO ALWAYS CHECK !! Valves in line with pistons may "snap back closed" by a rising piston, or as in some car engine etc. bend a push rod or break a rocker arm.......so take notice, there's a poppet. OK, the lad came home with his boroscope and has taken a look at the internals. Good news, the valves are opening and closing as they should. Fuel is getting thrown into the bore as should be. 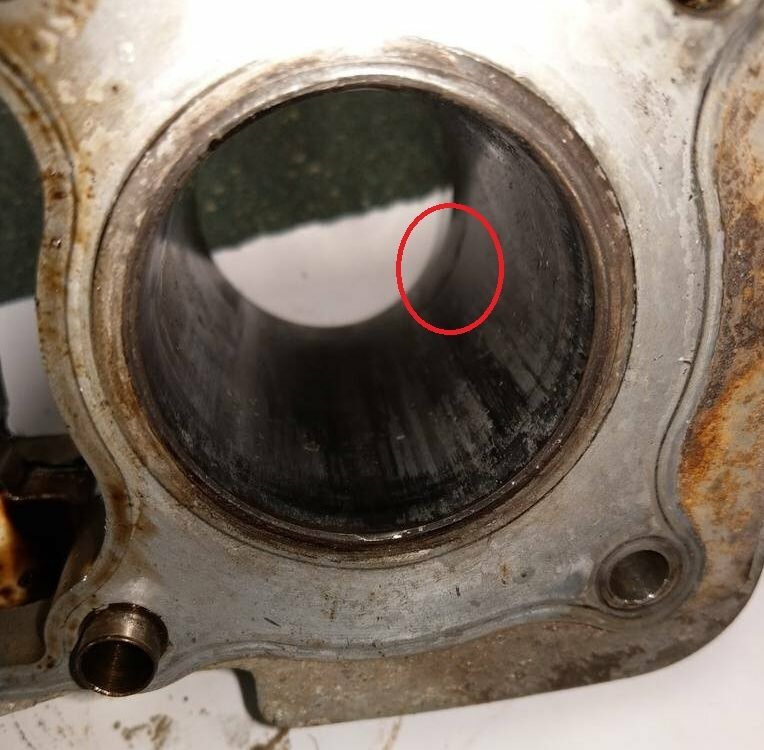 Bad news, the piston is moving about 3mm when turned over which would suggest that there is something more or less terminal, either broken piston skirt, rod, crank or like that kind of area. He's going to drop the engine, strip down, diagnose and act accordingly. Replace parts if cheap enough. Possibly a dropped CB? at the local scrappy with much panel damage but probably a good engine. OK, so the engine has had a strip down and it's not looking too good. Looks like the piston skirt has disintegrated and left to piston at the top of travel. Fortunately I'd already enemied him/he/it within a couple of posts. Also, @ L33n's weapons-grade retardation. Time to buy a new engine, there's no point trying to fix that. I dread to consider what condition the barrel is in. Really? Okay? Apart from the fact it's looking incredibly worn there's this. Yeah, tongue firmly in cheek when I posted. New barrel and piston on order. Rest of it being stripped, cleaned, checked and made sure no damage before reassembly. So, New bits arrived this lunchtime. Just need to have them fitted after a good clean out and check if the rest.